What a mother's body really looks like and how to start falling in love with yours again! Jade Beall's amazing photography shows just how beautiful a mother's body really is. Her photography challenges the very unrealistic body-image expectations for mothers that are promoted by the media. Get inspired by these wonderful images and learn about four ways to start loving your body - stretchmarks and all! A mother’s body is an object of beauty. For nine months she carries life within her, then gives birth to a miraculous new life. Her breasts and strong arms nourish, protect and carry her baby. Her heart cherishes and loves this little life like no one else can. The world doesn’t always see the beauty in a mother’s body. So what it does is surround women with unrealistic body image messages – a false portrayal of true beauty. The reality of pregnancy and post-pregnancy – wrinkles, stretch-marks, c-section scars, rounded bellies – are airbrushed away in images promoted by the media. What are really brandings of power and love are turned into badges of shame, and these unrealistic body images have a negative influence on women. Beall was soon flooded by requests from other women requesting for their post-partum bodies to be photographed, which is just what she did. There’s no one as beautiful as a mum with her family. Jade Beall Photography. Beall hopes to publish the series of photographs, named A Beautiful Body, into a book. While Beall has taken steps to redefine what ‘beautiful’ should be when it comes to mums, we are still a long way off from changing how the world perceives true beauty. One way to help make a change is to change our personal worldviews on what true beauty is, and start accepting our bodies as they are. Put aside baggy pregnancy clothes and invest in a few classic, well-fitting pieces. Dark-coloured tops and bottoms are great at hiding baby’s spit-up and can be easily jazzed up with bright accessories. Get a new haircut – one that’s quick and easy to maintain and still looks good – for days when you don’t have time to brush your hair. A touch of lip gloss and a dab of perfume after your morning shower will make you feel human again, especially after sleepless nights from trying to make baby sleep. 2. Ease into exercise: It’s really hard to even think about exercise when you are looking after your baby. For a start, why not do some gentle walking with your baby in tow? Mum and baby yoga is another great way to stretch those muscles while bonding with your bubba. Getting a mum-buddy to exercise with makes for great motivation too. 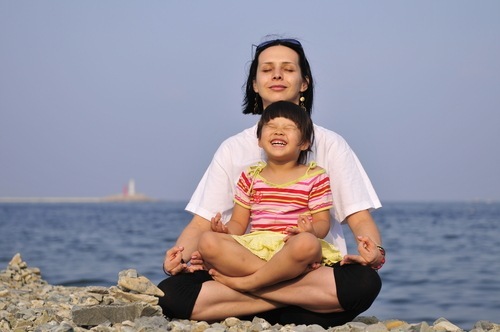 A great form of gentle exercise: mum and child yoga! 3. Stop comparing: It’s easy to see in another woman what you think you don’t have yourself as far as body image goes. Stop doing this; comparing your post-partum tummy with another woman’s flat stomach isn’t going to solve the problem. 5. Stop buying everything the media tells you: Many media channels have a way of making women feel they have to work so much harder than they already do to look good. What they won’t tell you is that the models they use have often been airbrushed to within an inch of their lives. Embrace yourself for who you are, stretchmarks and all! So very true, don’t you think? Do you have any other ideas on how mums can help themselves to love their post-baby bodies? Share your views by leaving a comment!